I am inspired by people's stories of change and how modernity liquifies aspects of identity that we mistake for solids. In LIQUID FEET series I capture moments in NYC where people go to relax or escape. 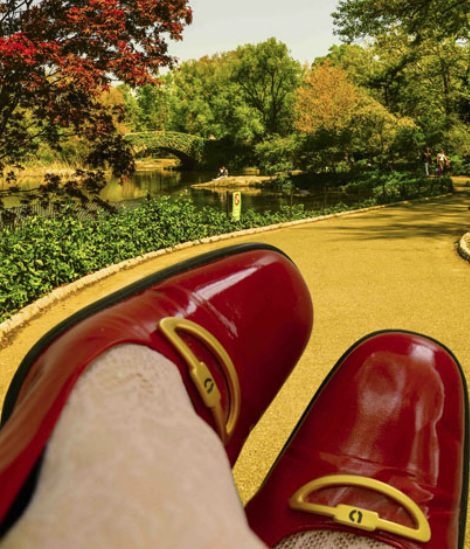 I then add a child's perspective using a pair of red wonder-shoes. Our feet are the main carriers of our physical selves. Through these series I ask: Is our identity a response to the choices we all make because of the shoes we walk in? Is it solid? Is it liquid?" Four of my photos taken during hurricane Sandy in Hoboken, New Jersey were exhibited at the New York Photo Festival 'SANDY: Devastation, Document, Drive' - a vast visual document of Superstorm Sandy. ONE EYE was a photo exhibition to fundraise for I Challenge Myself a nonprofit helping young people lead healthier and more productive lives through fitness challenges and leadership development. ONE EYE portraits show how the nutrition and cycling program of I CHALLENGE MYSELF has changed students’ lives, with ONE EYE on health and ONE EYE on development. The 'Shoes & the City: Central Park' series are a response to the choices we all make because of the environment and expectations around us. We don’t have to ONLY be the product of our environment. We are also allowed to DREAM. Lower yourself on the ground and be a child in adult shoes - then just smile, a child would. From that moment on just do what makes you happy. We're perpetually on the run for that better path, better shape, better colour, better taste, better feel, better view, better someone, better life! Sigmund Bauman’s liquid modernity... liquid love, liquid life, liquid fear, and liquid times have overtaken our identities. Can we accept to be imperfectly content? Can we stop chasing our feet? We're perpetually on the run for that better path, better shape, better colour, better taste, better feel, better view, better someone, better life! Can we learn to be imperfectly content? Are we trapped in the wrong holes? Are we just another cog in the wheel?Who will pull the breaks? To capture the qirkiness of Lewes (UK), I photographed artists living in it. Wearing a polka-dot dress, I became their muse for the day. I wanted the portraits stay true to the playfulness of their work and imagination. I photographed the famous painter & art critic Julian Bell, Bafta winner film director David Anderson and music composer & performer Dirk Campbell.